Sometimes, after I post a set of images, I get a lot of requests to explain how I created them. 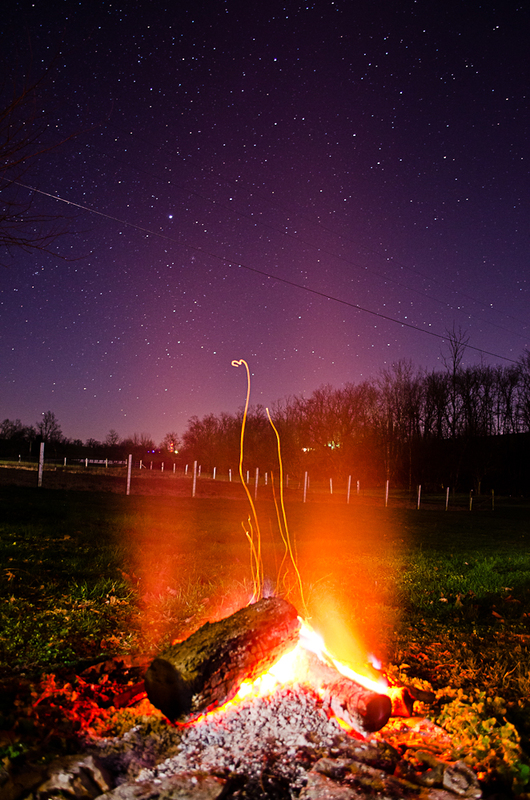 The image below (taken on New Year’s Eve near Bardstown, KY), is one that a lot of people have asked me about. Surprisingly, it was pretty simple to create. 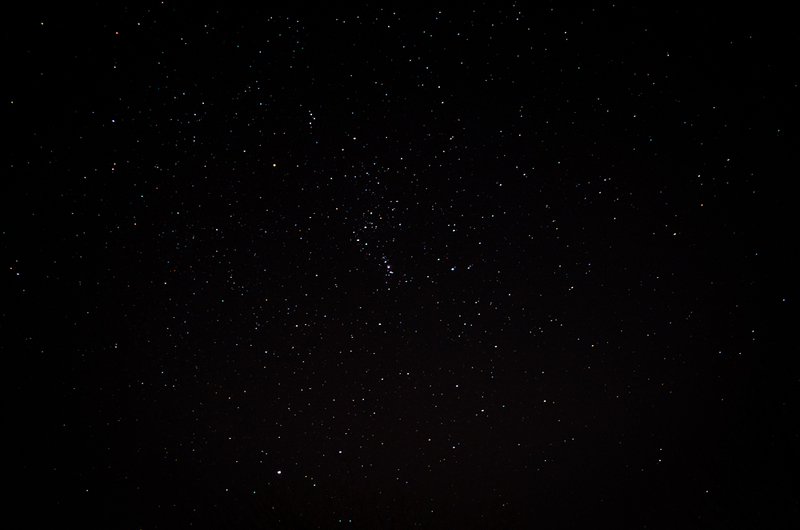 Well after dark, I set up my tripod around 100 feet away from the house, pointing out over an empty field. I framed the shot so that most of the image was sky, but so that there was also something in the foreground. In this case, that happened to be the plants in the field. It helps to have something in the foreground in images like this, because it gives the picture a sense of scale and a frame. I also took the below image (of Orion’s belt, which is nearly invisible because the long exposure caused a lot of other stars to become visible), which doesn’t have anything in the foreground, and which in my opinion is much less interesting to look at. After I had the composition the way I wanted it, it was time to consider my other settings. First was the trouble of focus. My camera was unable to autofocus on the stars, so I tried several things. First, I attempted to manually focus, which was tricky but could probably have worked if I had stuck with it. I also tried focusing on the treeline, which seemed to work pretty well when there was a treeline in the picture to focus on, but which I was worried would result in the stars losing sharpness. What I finally decided to do was to focus on the moon, move so that the moon was no longer in the shot, and then switch my lens to manual focus so that it wouldn’t attempt to refocus with every shot. I knew that I wanted to shoot with a long exposure, so I took several test pictures with shutter speeds between 1 and 30 seconds. I found that pretty much anything between 10 and 30 seconds produced the effect I wanted. One effect was that in longer shutter speeds, the trails from passing aircraft were longer. For both of the images above, the shutter speed I chose was 10 seconds. In order to get the results that I wanted (lots of stars and a definite separation between sky and ground) I chose an ISO of 800 and an aperture of 3.5. The lights of Bardstown, several miles away, helped separate the ground from the sky. If I wanted to, I could have lowered my ISO (thus getting less graininess) by setting my camera to Bulb and using a remote shutter release for a much longer shutter speed (2-5 minutes would probably have worked well). However, I don’t own a remote shutter release, and a longer shutter speed would have created distracting trails from planes, as there were many going overhead. Also, my camera performs pretty well at ISO 800, so it wasn’t really an issue. When I was ready to take the picture I used a 2 second self-timer so that I wouldn’t bump the camera when pressing the shutter. You can still see some evidence of camera shake in some of the pictures, though, so maybe I should have used a longer self-timer or tightened down the tripod a little more. Finally, after taking a few great shots of the sky, I decided that I needed something a little more interesting, and added in the remains of our New Year’s Eve fire. The settings for these images were similar, except that I changed my shutter speed to 20 seconds so that I would catch more sparks from the fire. I also used a stick to stir up sparks in some of the images. This image was a little trickier because of the power lines going through the backyard in several places. Also, the fire was built at the edge of a hill, and my tripod doesn’t go any lower than about 18 inches from the ground, so I couldn’t get quite as low as I would have liked. Still, I think it’s a really fabulous image, and I’m proud of everything I created that night. 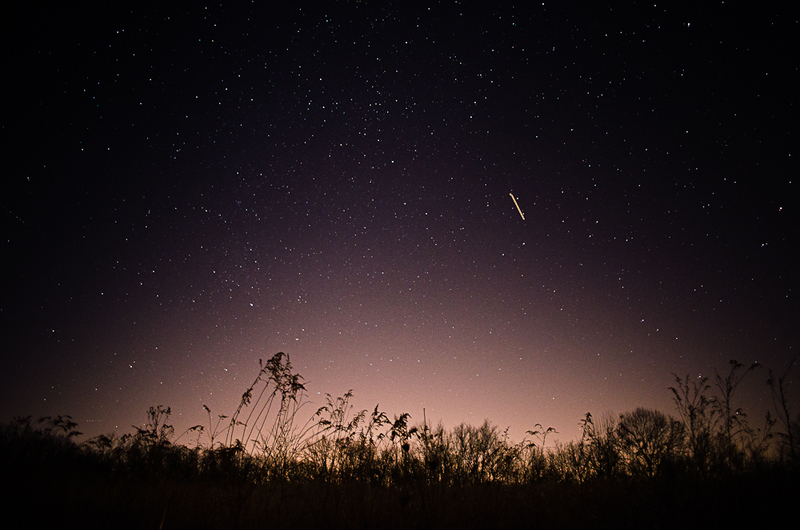 It was my first attempt at long exposure photography of the sky, and I definitely want to try again! If you enjoyed these pictures, you might also like to view 15 more examples of long exposure photography, which were in part the inspiration for this set of images. Do you have any questions about how I made these images, or others like them? Would you like to see more of this sort of post? Please let me know!